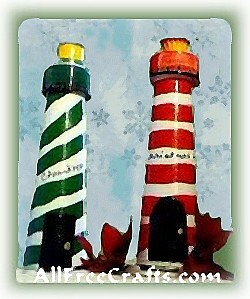 Recycled thread spools make the base for pretty lighthouse decorations for Christmas. These are so cute and easy! Although these two were made for the Christmas tree, you can use them for any season. They would look lovely placed on the fireplace mantel or going down the stairs. Start by painting the stripes the way you want them, going across and around or going in a spiral line going down. I used Christmas colors but you can use colors that match your decor. Next, paint the bottle spout cap in a color to match the lighthouse and paint the middle of the cap yellow to represent the lighthouse light. With some black paint, go all around the bottom lip of the cap in a line, then along this line paint on a row of small vertical to represent the walk way at the top of the lighthouse. Paint on the door and add some tiny windows, if you wish. I opted not to include windows. Trace the bottom of the lighthouse onto some craft fun foam, felt or cardboard. Cut out this shape and glue it to the bottom of the lighthouse. If you wish to add some leaves or Christmas flowers, glue them on before gluing on the bottom circle. If you will these lighthouse as Christmas tree ornaments, simply glue some ribbon or string on the back to use as a hanger. Optional: Use a permanent marker to write the year of your Christmas creation and your initials or signature. Enjoy!